This article originally appeared in the Fall 2018 HEOP newsletter. Being a student at Syracuse University for my entire academic career can be simply put as a dream come true. Words are not enough to express my gratitude that being a part of the HEOP Program has had on me for the last eleven years. Upon acceptance to Syracuse University in March 2007, my excitement was met with fear of the all of the unknowns of being a first year college student. When I came to Syracuse for SummerStart, our incoming class was introduced to the HEOP staff and I immediately felt a connection that was so family oriented, committed, and motivating to its students. My HEOP counselor for my undergraduate and graduate career, Marian Cappelletti, was the most helpful person in my academic career, helping me navigate through SU academically, socially, and personally. 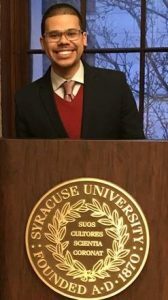 After going back and forth with ideas for life after Syracuse, my passion for studying the past and helping the future led me to my calling in education. Being one of the first students to graduate from the School of Education under a five-year model, earning a bachelor’s degree in History and master’s degree from the School of Education in Social Studies Education set the foundation for the career I love, being a teacher. At SU, I was able to Study Abroad in Hong Kong, in which I conducted a comparative study on education in Hong Kong and the United States, taught at an international school, and became involved on campus. Following graduation from SU ’12, G’12 I have held many roles within education teaching in a public and charter high schools for five years while serving as a department chair and instructional coach. Throughout my teaching when the time came to talk to students about college, I would always speak about my experience at SU, the HEOP Program and encourage my students to apply. The culmination of my career came at the beginning of the 2015-2016 school year when I was profiled on NBC’s Meredith Vieria daytime talk show and meeting the inspiration for me becoming a teacher, Steve Harvey. While in the classroom, I would always make visits to SU and would always make a visit to the HEOP office to visit the counselors and update them on what I am doing. 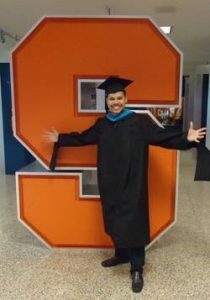 After five years in the classroom, I returned to Syracuse University in 2017 to pursue a doctoral degree in Cultural Foundations of Education. My biggest reason for coming back to SU was the feeling of being at home making it an easy decision to make. I knew that coming back here I would always have a home with HEOP. Currently at SU, my research interests are to analyze the role of African American museums throughout the United States in the past and present and how they can be models of representation and engagement of social justice education in classrooms and communities. Since returning to SU, I have been able to continue my connection to HEOP by teaching the SummerStart Seminar course, CAS 102 for incoming HEOP students and this past summer serving as its Curriculum Developer for the Seminar. For all the opportunities and guidance that was given to me by HEOP, to now be in a position where I can teach future HEOP students with the same commitment as was given to me during my undergraduate and graduate career, I couldn’t ask for a better continuation of opportunity. Without the support and guidance of HEOP, I would not have any of the successes that I have had in education over the last eleven years and for that, I am eternally grateful. In my role as educator, I will look to continue to give the future what was given to me, an opportunity to fulfill my dreams.